Central route in the Maze District of Canyonlands N.P. 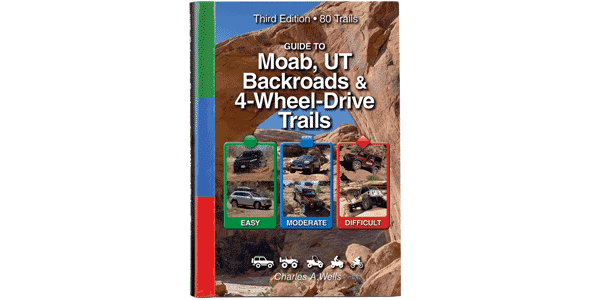 This trail features a spectacular descent down tight switchbacks, followed by a narrow shelf road along a high, scenic ridge. When you reach the end of the trail at Wpt. 05, you are a long way from a gas station. See Area 5 introduction on page 198. You can return the way you came or continue to Hwy. 95 via Trails 74 or 75. Read trail descriptions carefully. Also in the Area 5 introduction you’ll find rules and regulations for the Maze area and important driving tips. Switchbacks are very steep and narrow but, when dry, are generally passable by high-clearance, 4x4 stock vehicles with low-range gearing. Difficult or impassable after storms. Bentonite clay-surface road along ridge after Waypoint 04 is dangerously slippery when wet. Proceed with caution.